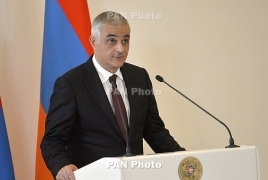 PanARMENIAN.Net - The World Congress on Information Technology (WCIT) will be held in Yerevan in October 2019, Armenian Deputy Prime Minister Mher Grigoryan said Friday, February 1 at the Digital Agenda in the Era of Globalization 2.0 Innovation Ecosystem of Eurasia Forum. According to Grigoryan, Google, Amazon, Facebook and other companies have already confirmed their participation in the congress. The deputy chairman of the government invited all forum participants to take part in the event, which will be held from October 6 to 9 in the Armenian capital, MIR 24 reports. WCIT is an annual congress where the world’s leading technology thinkers and innovators gather to advance the conversation on the key questions facing the industry and the world. Framing the discussions of the 2019 congress will be the theme: “Fulfilling the Promise of the Digital Age - The Power of Decentralization”. The congress brings together more than 2,000 high-level public and public sector representatives from over 60 countries, including heads of state, investors, startup founders, and academic thought leaders.